I have a small stack of books on my desk, books that I’ve read with the best of intentions to review, and as of yet, have not actually put my fingers to work on them. Freight is one of those books, by no fault of its own. It’s just, at the time I was reading it, I was carrying a lot, it was hard for me to carry, and I put down as much as I could as often as I could, and unfortunately, it was often this book, I swallowed down its pages because I was hungry like someone who hates food is so hungry. This book, in the end, gave me back my appetite. It is a soft, beautiful book. Even the texture of the cover hints at the clouds you’ll find inside. The book itself read more to me like a memoir perhaps, than a novel. There was no overarching narrative arc to the book beyond the arcs present in the individual chapters. What there is throughout is a constant, maintained feeling of earnestness, of searching. The story moves like memories move: blurring, doubling back, building upon one another. And Bosworth masterfully plays this up with quite possibly one my favorite formal plays I’ve seen in a book. 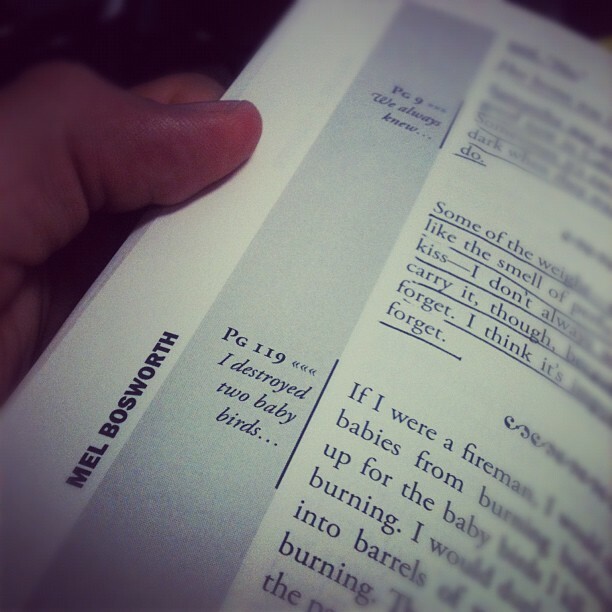 Throughout the book, you come across a sort of marginalia directing you to another page, where you’ll find a passage in some way related to the current passage. It’s akin to choose your own adventure, but not. For one, at no point will you turn the page and die. But also, because you’re not required to turn to the referenced passage. And it’s in this way that I find it truly genius. See, normally I tend to be annoyed at plays like this. There’s a cheekiness to them that grates me more than excites me. But this is so unobtrusive, so elegantly done that I love it. And what’s more, I recommend following the references. It highlights the nature of the stories, and in turn, the nature of how we all reconstruct our lives from bits and pieces of memories. But I don’t want to spend anymore words on that and leave you feeling like it’s the only take-away from Freight, because Bosworth’s writing itself demands its own attention. I love Bosworth’s style; it is vulnerable and simple and good. Lucas was sitting in a black hole that no one could see. But I could see what it was doing to him. And it did it to him for a long time. He was almost eaten up by it. His black hole was different than mine because his black hole could be battled with medicine. My black hole could be battled with sunshine. It’s just a matter of understanding our own black hole and accepting the treatment. They make sunshine in a bottle. It’s called Vitamin D. They also make sunshine in other forms. Like friends and the outdoors and good work and good sleep and love. It’s a voice that carries you through the book, that despite some of the awful things the protagonist admits, makes you want the best for him, for everyone. 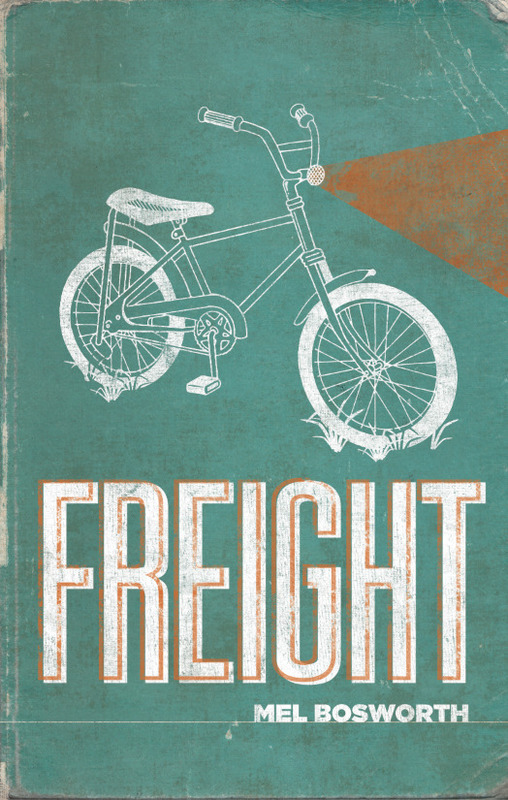 In short, Freight is one of those books that makes you want to be a better person, to live a softer life. You can also win Bosworth’s latest book Every Laundromat in the World along with a stash of other books by Safety Third Enterprises by entering our poetry-bomb contest.